The acronym “AIA” stands for the American Institute of Architects, a professional organization for architects that offers education, government advocacy, community redevelopment, and public outreach to support the architecture profession and improve its public image. This is an elective organization but if you are a practicing architect, you would be hard pressed to give me a reason why I shouldn’t be a member. I have been a member for decades and my involvement has ranged from extremely heavy to almost non-existent. Early on in my career I became involved in my local AIA component – the Dallas Chapter AIA – and over the last 15 years I have served and chaired almost every major committee. During this time I met people and made connections that helped shape my early career and in the years since have continued to serve me well because almost every job I’ve ever had was through connections I made while serving. 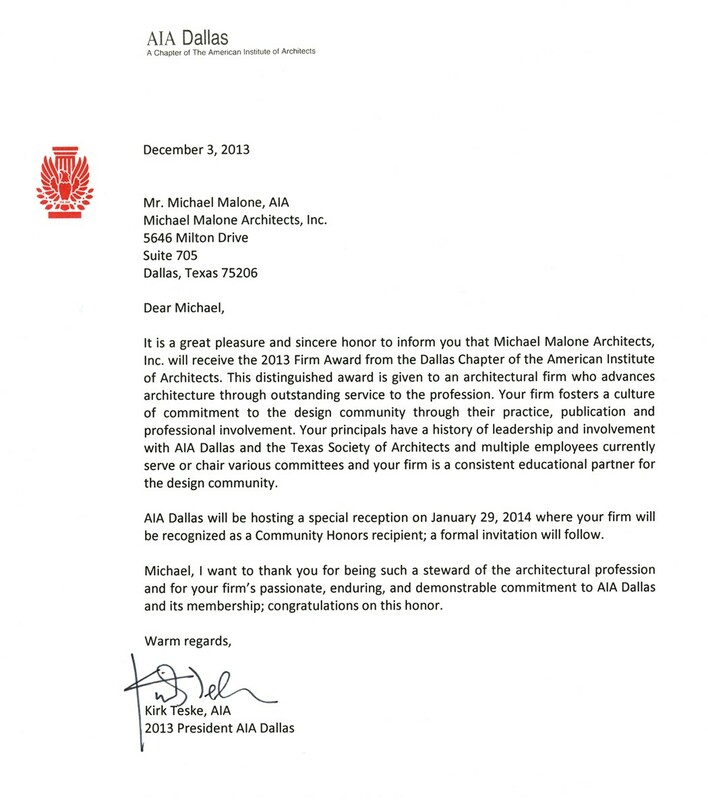 In 2010, I was recognized for my efforts and was presented with the AIA Dallas Young Architect of the Year. Yes, even at 42 years old, I was considered a “young” architect. As proud as I am of this recognition, I am more proud of the things I accomplished during this time. I was given the latitude to make the changes I envisioned and I was able to shape my experience to suit my interests. For those of you who know me, you’ll know that I generally have an opinion on everything and don’t have a problem sharing that opinion. The AIA gave me the outlet to put my ideas into action and helped provide the resources that helped make those actions a success. The quote above is from Gandhi and I felt it is particularly relevant to today’s post. The change he is referencing isn’t about personal transformation – Gandhi is telling us that only by people working together with vision and consistency can real change be made. I truly believe this sentiment to be true and think that getting involved is important … as a result, everyone in my current office is a member of the AIA and all are heavily involved. As a result of our participation, we found out last week that our firm has received the 2013 Firm Award from the Dallas Chapter of the American Institute of Architects. I’ve included a copy of the letter we received below [click to enlarge] which explains why our firm was selected. A question I often get from my peers who know I am active in the AIA is what does it do for you? I’m in it because I’m an architect; it’s where I belong. It’s the place where the people I respect and admire most who do what I do are recognized and understood in the framework of the what we do for a living. It’s the place where I’ve made the best friends, had my self-worth reinforced by those in similar circumstances, and I’ve learned that I am not alone in the things I encounter in my day-to-day practice. It’s a place where all of the people speak my language, share common values, and for the most part, similar goals and aspirations. It’s a place where everyone around me knows and understands what I do and admires (or envies or despises) how I do it. In many ways it’s my professional and spiritual home. The AIA, and more specifically the Texas Society of Architects, which is my state component, has given me an outlet for the things I am passionate about: design and architectural writing. As with any organization made up of members, there are a wide variety of committees where you can serve that allow you to voice and exercise your interests. In my case, it was participating on the Publications Committee, which oversees our award-winning magazine, Texas Architect where I have the opportunity to write and guide the editorial content. I was also heavily involved in the Design Committee, which provided an opportunity to be part of the state architectural awards program, which in turn allowed me to meet prominent architects from around the nation who acted as jurors. During my time on the Design Committee, while working with one of my colleagues, I was able to put forward the idea of an annual design conference hosted by the Texas Society of Architects in various cities around the state. These conferences have brought in accomplished architects as speakers and allow attendees to tour a wide variety of architectural projects. Joining us for our last two conferences were Bryan MacKay Lyons, Edward Bosley, Thomas Phifer, Marion Weiss and Michael Manfredi. For our upcoming conference in January of 2014, we have Rand Elliot, Marlon Blackwell, Victor Trahan and Victor Legoretta presenting to us. As with anything is life, you get out of it what you put into it. It’s a tiresome statement, however for me one that’s just not true…I’ve received back vastly more than I ever put in. The friendship and fellowship alone are worth the price of admission. I encourage you to become active, to find your place among your peers and have a lot of fun doing it. It’s the only way you’ll know what you’ve been missing and it’s not too late to join in. This is important. Get involved, meet people, make things happen – the things that matter to you.